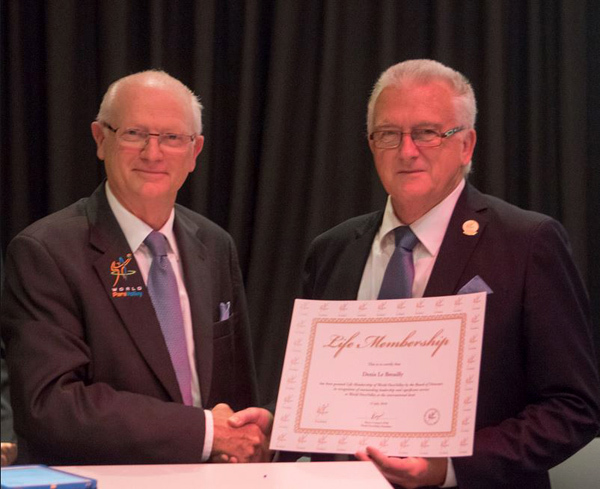 Previous SWVA Ref Administrator Denis Le Breuilly has been made a life member of the World ParaVolley in reconision of his work. Denis’ dedication to the activities and development of World ParaVolley is perhaps best illustrated by the number of roles he has undertaken for the movement over the years. Denis began his contribution as a Referee from 1992 when he attended and passed the International Referee Course in London. His Refereeing career in World ParaVolley continued until 2001. In fact his Refereeing career was so significant that he was the first British Referee to have officiated in international matches in 4 disciplines: FIVB (indoor and Beach Volleyball) and World ParaVolley (Sitting and Standing Volleyball). As an administrator, Denis has held the roles of Secretary of the Referee Commission, Chair of the Rules Committee, Chair of the Constitution Committee, interim General Manager, and Sport Director, all at the World ParaVolley level. Denis’ ParaVolley technical knowledge has enabled him to effectively deliver the London 2012 and Rio 2016 Paralympic Games on behalf of World ParaVolley as the Technical Delegate. He has also acted as Technical Delegate at numerous other World ParaVolley international events. This entry was posted in News, Sitting. Bookmark the permalink.